Appropriately mothballed historic building. Photo: NPS files. 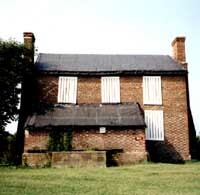 When all means of finding a productive use for a historic building have been exhausted or when funds are not currently available to put a deteriorating structure into a useable condition, it may be necessary to close up the building temporarily to protect it from the weather as well as to secure it from vandalism. This process, known as mothballing, can be a necessary and effective means of protecting the building while planning the property's future, or raising money for a preservation, rehabilitation or restoration project. If a vacant property has been declared unsafe by building officials, stabilization and mothballing may be the only way to protect it from demolition. This building has been successfully mothballed for 10 years because the roof and walls were repaired and structurally stabilized, ventilation louvers added, and the property maintained. Photo: NPS files. This Preservation Brief focuses on the steps needed to "de-activate" a property for an extended period of time. The project team will usually consist of an architect, historian, preservation specialist, sometimes a structural engineer, and a contractor. Mothballing should not be done without careful planning to ensure that needed physical repairs are made prior to securing the building. The steps discussed in this Brief can protect buildings for periods of up to ten years; long-term success will also depend on continued, although somewhat limited, monitoring and maintenance. For all but the simplest projects, hiring a team of preservation specialists is recommended to assess the specific needs of the structure and to develop an effective mothballing program. A vacant historic building cannot survive indefinitely in a boarded-up condition, and so even marginal interim uses where there is regular activity and monitoring, such as a caretaker residence or non-flammable storage, are generally preferable to mothballing. 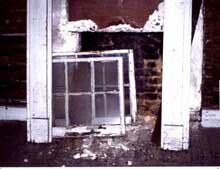 In a few limited cases when the vacant building is in good condition and in a location where it can be watched and checked regularly, closing and locking the door, setting heat levels at just above freezing, and securing the windows may provide sufficient protection for a period of a few years. Boarding up without adequate ventilation and maintenance has accelerated deterioration of this property. Photo: NPS files. But if long-term mothballing is the only remaining option, it must be done properly. This will require stabilization of the exterior, properly designed security protection, generally some form of interior ventilation—either through mechanical or natural air exchange systems—and continued maintenance and surveillance monitoring. 1. Document the architectural and historical significance of the building. 2. Prepare a condition assessment of the building. 3. Structurally stabilize the building, based on a professional condition assessment. 4. Exterminate or control pests, including termites and rodents. 5. Protect the exterior from moisture penetration. 6. Secure the building and its component features to reduce vandalism or break-ins. 7. Provide adequate ventilation to the interior. 8. Secure or modify utilities and mechanical systems. 9. Develop and implement a maintenance and monitoring plan for protection. These steps will be discussed in sequence below. Documentation and stabilization are critical components of the process and should not be skipped over. Mothballing measures should not result in permanent damage, and so each treatment should be weighed in terms of its reversibility and its overall benefit. 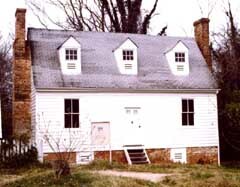 Documenting the historical significance and physical condition of the property will provide information necessary for setting priorities and allocating funds. The project team should be cautious when first entering the structure if it has been vacant or is deteriorated. It may be advisable to shore temporarily areas appearing to be structurally unsound until the condition of the structure can be fully assessed. If pigeon or bat droppings, friable asbestos or other health hazards are present, precautions must be taken to wear the appropriate safety equipment when first inspecting the building. Consideration should be given to hiring a firm specializing in hazardous waste removal if these highly toxic elements are found in the building. Types of building materials, construction techniques, and any unusual detailing or regional variations of craftsmanship. Old photographs can be helpful in identifying early or original features that might be hidden under modern materials. On a walk-through, the architect, historian, or preservation specialist should identify the architecturally significant elements of the building, both inside and out. Documenting a building's history and assessing its condition provide information to set priorities for stabilization and repair, prior to mothballing. Photo: NPS files. By understanding the history of the resource, significant elements, even though deteriorated, may be spared the trash pile. 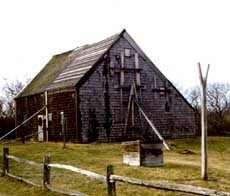 For that reason alone, any materials removed from the building or site as part of the stabilization effort should be carefully scrutinized and, if appearing historic, should be photographed, tagged with a number, inventoried, and safely stored, preferably in the building, for later retrieval. A site plan and schematic building floor plans can be used to note important information for use when the building is eventually preserved, restored, or rehabilitated. Each room should be given a number and notations added to the plans regarding the removal of important features to storage or recording physical treatments undertaken as part of the stabilization or repair. Because a mothballing project may extend over a long period of time, with many different people involved, clear records should be kept and a building file established. Copies of all important data, plans, photographs, and lists of consultants or contractors who have worked on the property should be added to the file as the job progresses. Recording actions taken on the building and identifying where elements that have been removed are stored will be helpful in the future. The project coordinator should keep the building file updated and give duplicate copies to the owner. A list of emergency numbers, including the number of the key holder, should be kept at the entrance to the building or on a security gate, in a transparent vinyl sleeve. A condition assessment can provide the owner with an accurate overview of the current condition of the property. If the building is deteriorated or if there are significant interior architectural elements that will need special protection during the mothballing years, undertaking a condition assessment is highly recommended, but it need not be exhaustive. A modified condition assessment, prepared by an architect or preservation specialist, and in some case a structural engineer, will help set priorities for repairs necessary to stabilize the property for both the short and long-term. 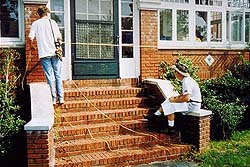 It will evaluate the age and condition of the following major elements: foundations; structural systems; exterior materials; roofs and gutters; exterior porches and steps; interior finishes; staircases; plumbing, electrical, mechanical systems; special features such as chimneys; and site drainage. To record existing conditions of the building and site, it will be necessary to clean debris from the building and to remove unwanted or overgrown vegetation to expose foundations. The interior should be emptied of its furnishing (unless provisions are made for mothballing these as well), all debris removed, and the interior swept with a broom. Building materials too deteriorated to repair, or which have come detached, such as moldings, balusters, and decorative plaster, and which can be used to guide later preservation work, should be tagged, labeled and saved. Photographs or a videotape of the exterior and all interior spaces of the resource will provide an invaluable record of "as is" conditions. If a videotape is made, oral commentary can be provided on the significance of each space and architectural feature. If 35mm photographic prints or slides are made, they should be numbered, dated, and appropriately identified. Photographs should be cross-referenced with the room numbers on the schematic plans. A systematic method for photographing should be developed; for example, photograph each wall in a room and then take a corner shot to get floor and ceiling portions in the picture. Photograph any unusual details as well as examples of each window and door type. For historic buildings, the great advantage of a condition assessment is that architectural features, both on the exterior as well as the interior, can be rated on a scale of their importance to the integrity and significance of the building. Those features of the highest priority should receive preference when repairs or protection measures are outlined as part of the mothballing process. Potential problems with protecting these features should be identified so that appropriate interim solutions can be selected. For example, if a building has always been heated and if murals, decorative plaster walls, or examples of patterned wall paper are identified as highly significant, then special care should be taken to regulate the interior climate and to monitor it adequately during the mothballing years. This might require retaining electrical service to provide minimal heat in winter, fan exhaust in summer, and humidity controls for the interior. 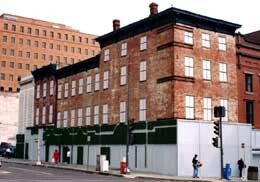 Stabilization as part of a mothballing project involves correcting deficiencies to slow down the deterioration of the building while it is vacant. Weakened structural members that might fail altogether in the forthcoming years must be braced or reinforced; insects and other pests removed and discouraged from returning; and the building protected from moisture damage both by weatherizing the exterior envelope and by handling water run-off on the site. Even if a modified use or caretaker services can eventually be found for the building, the following steps should be addressed. While bracing may have been required to make the building temporarily safe for inspection, the condition assessment may reveal areas of hidden structural damage. Roofs, foundations, walls, interior framing, porches and dormers all have structural components that may need added reinforcement. Interior bracing which will last the duration of the mothballing will protect weakened structural members. Photo: John Milner Architects. Structural stabilization by a qualified contractor should be done under the direction of a structural engineer or a preservation specialist to ensure that the added weight of the reinforcement can be sustained by the building and that the new members do not harm historic finishes. Any major vertical post added during the stabilization should be properly supported and, if necessary, taken to the ground and underpinned. If the building is in a northern climate, then the roof framing must be able to hold substantial snow loads. Bracing the roof at the ridge and mid-points should be considered if sagging is apparent. Likewise, interior framing around stair openings or under long ceiling spans should be investigated. Underpinning or bracing structural piers weakened by poor drainage patterns may be a good precaution as well. Damage caused by insects, moisture, or from other causes should be repaired or reinforced and, if possible, the source of the damage removed. 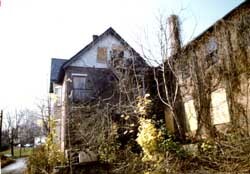 If features such as porches and dormers are so severely deteriorated that they must be removed, they should be documented, photographed, and portions salvaged for storage prior to removal. If the building is in a southern or humid climate and termites or other insects are a particular problem, the foundation and floor framing should be inspected to ensure that there are no major structural weaknesses. This can usually be done by observation from the crawl space or basement. For those structures where this is not possible, it may be advisable to lift selective floor boards to expose the floor framing. If there is evidence of pest damage, particularly termites, active colonies should be treated and the structural members reinforced or replaced, if necessary. Pests can be numerous and include squirrels, raccoons, bats, mice, rats, snakes, termites, moths, beetles, ants, bees and wasps, pigeons, and other birds. Termites, beetles, and carpenter ants destroy wood. Mice, too, gnaw wood as well as plaster, insulation, and electrical wires. Pigeon and bat droppings not only damage wood finishes but create a serious and sometimes deadly health hazard. If the property is infested with animals or insects, it is important to get them out and to seal off their access to the building. If necessary, exterminate and remove any nests or hatching colonies. Chimney flues may be closed off with exterior grade plywood caps, properly ventilated, or protected with framed wire screens. Existing vents, grills, and louvers in attics and crawl spaces should be screened with bug mesh or heavy duty wire, depending on the type of pest being controlled. It may be advantageous to have damp or infected wood treated with insecticides (as permitted by each state) or preservatives, such as borate, to slow the rate of deterioration during the time that the building is not in use. Regrading has protected this masonry foundation wall from excessive damp during its 10-year mothballing. Note the attic and basement vents, temporary stairs, and interpretive sign. Photo: NPS files. It is important to protect the exterior envelope from moisture penetration before securing the building. Leaks from deteriorated or damaged roofing, from around windows and doors, or through deteriorated materials, as well as ground moisture from improper site run-off or rising damp at foundations, can cause long-term damage to interior finishes and structural systems. Any serious deficiencies on the exterior, identified in the condition assessment, should be addressed. 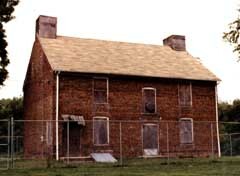 To the greatest extent possible, these weatherization efforts should not harm historic materials. The project budget may not allow deteriorated features to be fully repaired or replaced in-kind. Non-historic or modern materials may be used to cover historic surfaces temporarily, but these treatments should not destroy valuable evidence necessary for future preservation work. Temporary modifications should be as visually compatible as possible with the historic building. Roofs are often the most vulnerable elements on the building exterior and yet in some ways they are the easiest element to stabilize for the long term, if done correctly. "Quick fix" solutions, such as tar patches on slate roofs, should be avoided as they will generally fail within a year or so and may accelerate damage by trapping moisture. They are difficult to undo later when more permanent repairs are undertaken. Use of a tarpaulin over a leaking roof should be thought of only as a very temporary emergency repair because it is often blown off by the wind in a subsequent storm. If the existing historic roof needs moderate repairs to make it last an additional ten years, then these repairs should be undertaken as a first priority. Replacing cracked or missing shingles and tiles, securing loose flashing, and reanchoring gutters and downspouts can often be done by a local roofing contractor. If the roof is in poor condition, but the historic materials and configuration are important, a new temporary roof, such as a lightweight aluminum channel system over the existing, might be considered. If the roofing is so deteriorated that it must be replaced and a lightweight aluminum system is not affordable, various inexpensive options might be considered. These include covering the existing deteriorated roof with galvanized corrugated metal roofing panels, or 90 lb. rolled roofing, or a rubberized membrane (refer back to cover photo). These alternatives should leave as much of the historic sheathing and roofing in place as evidence for later preservation treatments. Urban buildings often need additional protection from unwanted entry and graffiti. This commercial building uses painted plywood panels to cover its glass storefronts. The upper windows on the street sides have been painted to resemble 19th century sash. Photo: NPS files. 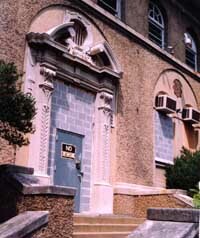 For masonry repairs, appropriate preservation approaches are essential. For example, if repointing deteriorated brick chimneys or walls is necessary to prevent serious moisture penetration while the building is mothballed, the mortar should match the historic mortar in composition, color, and tooling. The use of hard portland cement mortars or vapor-impermeable waterproof coatings are not appropriate solutions as they can cause extensive damage and are not reversible treatments. For wood siding that is deteriorated, repairs necessary to keep out moisture should be made; repainting is generally warranted. Cracks around windows and doors can be beneficial in providing ventilation to the interior and so should only be caulked if needed to keep out bugs and moisture. For very deteriorated wall surfaces on wooden frame structures, it may be necessary to sheathe in plywood panels, but care should be taken to minimize installation damage by planning the location of the nailing or screw patterns or by installing panels over a frame of battens. Generally, however, it is better to repair deteriorated features than to cover them over. Foundation damage may occur if water does not drain away from the building. Run-off from gutters and downspouts should be directed far away from the foundation wall by using long flexible extender pipes equal in length to twice the depth of the basement or crawl space. If underground drains are susceptible to clogging, it is recommended that the downspouts be disconnected from the drain boot and attached to flexible piping. If gutters and downspouts are in bad condition, replace them with inexpensive aluminum units. If there are no significant landscape or exposed archeological elements around the foundation, consideration should be given to regrading the site if there is a documented drainage problem. If building up the grade, use a fiber mesh membrane to separate the new soil from the old and slope the new soil 6 to 8 feet (200 cm-266 cm) away from the foundation making sure not to cover up the dampcourse layer or come into contact with skirting boards. To keep vegetation under control, put down a layer of 6 mil black polyethylene sheeting or fiber mesh matting covered with a 2"-4" (5-10 cm.) of washed gravel. If the building suffers a serious rising damp problem, it may be advisable to eliminate the plastic sheeting to avoid trapping ground moisture against foundations. The actual mothballing effort involves controlling the long-term deterioration of the building while it is unoccupied as well as finding methods to protect it from sudden loss by fire or vandalism. This requires securing the building from unwanted entry, providing adequate ventilation to the interior, and shutting down or modifying existing utilities. Once the building is de-activated or secured, the long-term success will depend on periodic maintenance and surveillance monitoring. Securing the building from sudden loss is a critical aspect of mothballing. Because historic buildings are irreplaceable, it is vital that vulnerable entry points are sealed. If the building is located where fire and security service is available then it is highly recommended that some form of monitoring or alarm devices be used. The first floor openings of this historic building have been filled with cinder blocks and the doors, window sash, and frames removed for safe keeping. The security metal door features heavy duty locks. Photo: NPS files. To protect decorative features, such as mantels, lighting fixtures, copper downspouts, iron roof cresting, or stained glass windows from theft or vandalism, it may be advisable to temporarily remove them to a more secure location if they cannot be adequately protected within the structure. 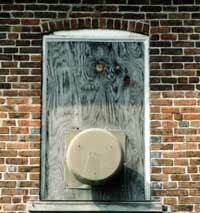 Mothballed buildings are usually boarded up, particularly on the first floor and basement, to protect fragile glass windows from breaking and to reinforce entry points. Infill materials for closing door and window openings include plywood, corrugated panels, metal grates, chain fencing, metal grills, and cinder or cement blocks. The method of installation should not result in the destruction of the opening and all associated sash, doors, and frames should be protected or stored for future reuse. Generally exterior doors are reinforced and provided with strong locks, but if weak historic doors would be damaged or disfigured by adding reinforcement or new locks, they may be removed temporarily and replaced with secure modern doors. Alternatively, security gates in an new metal frame can be installed within existing door openings, much like a storm door, leaving the historic door in place. If plywood panels are installed over door openings, they should be screwed in place, as opposed to nailed, to avoid crowbar damage each time the panel is removed. This also reduces pounding vibrations from hammers and eliminates new nail holes each time the panel is replaced. For windows, the most common security feature is the closure of the openings; this may be achieved with wooden or pre-formed panels or, as needed, with metal sheets or concrete blocks. Plywood panels, properly installed to protect wooden frames and properly ventilated, are the preferred treatment from a preservation standpoint. This painted trompe l'eoil scene on plywood panels is a neighborhood-friendly device. Photo: NPS files. There are a number of ways to set insert plywood panels into windows openings to avoid damage to frame and sash. One common method is to bring the upper and lower sash of a double hung unit to the mid-point of the opening and then to install pre-cut plywood panels using long carriage bolts anchored into horizontal wooden bracing, or strong backs, on the inside face of the window. Another means is to build new wooden blocking frames set into deeply recessed openings, for example in an industrial mill or warehouse, and then to affix the plywood panel to the blocking frame. If sash must be removed prior to installing panels, they should be labeled and stored safely within the building. Plywood panels are usually 1/2"-3/4" (1.25-1.875 cm.) thick and made of exterior grade stock, such as CDX, or marine grade plywood. They should be painted to protect them from delamination and to provide a neater appearance. These panels may be painted to resemble operable windows or treated decoratively. With extra attention to detail, the plywood panels can be trimmed out with muntin strips to give a shadow line simulating multi-lite windows. This level of detail is a good indication that the building is protected and valued by the community. If the building has shutters simply close the shutters and secure them from the interior. If the building had shutters historically, but they are missing, it may be appropriate to install new shutters, even in a modern material, and secure them in the closed position. Louvered shutters will help with interior ventilation if the sash are propped open behind the shutters. 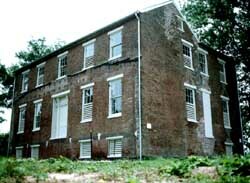 A view showing the exterior of the Brearley House, New Jersey, in its mothballed condition Photo: Michael Mills, Ford Farewell Mills Gatsch, Architects. There is some benefit from keeping windows unboarded if security is not a problem. The building will appear to be occupied, and the natural air leakage around the windows will assist in ventilating the interior. The presence of natural light will also help when periodic inspections are made. Rigid polycarbonate clear storm glazing panels may be placed on the window exterior to protect against glass breakage. Because the sun's ultraviolet rays can cause fading of floor finishes and wall surfaces, filtering pull shades or inexpensive curtains may be options for reducing this type of deterioration for significant interiors. Some acrylic sheeting comes with built-in ultraviolet filters. Securing the building from catastrophic destruction from fire, lightning, or arson will require additional security devices. Lightning rods properly grounded should be a first consideration if the building is in an area susceptible to lightning storms. A high security fence should also be installed if the property cannot be monitored closely. These interventions do not require a power source for operation. Since many buildings will not maintain electrical power, there are some devices available using battery packs, such as intrusion alarms, security lighting, and smoke detectors which through audible horn alarms can alert nearby neighbors. These battery packs must be replaced every 3 months to 2 years, depending on type and use. In combination with a cellular phone, they can also provide some level of direct communication with police and fire departments. If at all possible, new temporary electric service should be provided to the building. Generally a telephone line is needed as well. A hard wired security system for intrusion and a combination rate-of-rise and smoke detector can send an immediate signal for help directly to the fire department and security service. Depending on whether or not heat will be maintained in the building, the security system should be designed accordingly. Some systems cannot work below 32∞F (0∞C). Exterior lighting set on a timer, photo electric sensor, or a motion/infra-red detection device provides additional security. Once the exterior has been made weathertight and secure, it is essential to provide adequate air exchange throughout the building. Without adequate air exchange, humidity may rise to unsafe levels, and mold, rot, and insect infestation are likely to thrive. The needs of each historic resource must be individually evaluated because there are so many variables that affect the performance of each interior space once the building has been secured. This exhaust fan has tamper-proof housing. Photo: Michael Mills, Ford Farewell Mills Gatsch, Architects. A mechanical engineer or a specialist in interior climates should be consulted, particularly for buildings with intact and significant interiors. In some circumstances, providing heat during the winter, even at a minimal 45∞ F (7∞C), and utilizing forced-fan ventilation in summer will be recommended and will require retaining electrical service. For masonry buildings it is often helpful to keep the interior temperature above the spring dew point to avoid damaging condensation. In most buildings it is the need for summer ventilation that outweighs the winter requirements. Many old buildings are inherently leaky due to loose-fitting windows and floorboards and the lack of insulation. The level of air exchange needed for each building, however, will vary according to geographic location, the building's construction, and its general size and configuration. 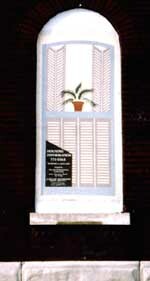 There are four critical climate zones when looking at the type and amount of interior ventilation needed for a closed up building: hot and dry (southwestern states); cold and damp (Pacific northwest and northeastern states); temperate and humid (Mid-Atlantic states, coastal areas); and hot and humid (southern states and the tropics). Once closed up, a building interior will still be affected by the temperature and humidity of the exterior. Without proper ventilation, moisture from condensation may occur and cause damage by wetting plaster, peeling paint, staining woodwork, warping floors, and in some cases even causing freeze thaw damage to plaster. If moist conditions persist in a property, structural damage can result from rot or returning insects attracted to moist conditions. Poorly mothballed masonry buildings, particularly in damp and humid zones have been so damaged on the interior with just one year of unventilated closure that none of the interior finishes were salvageable when the buildings were rehabilitated. 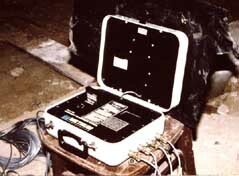 Portable monitors are used to record temperature and humidity conditions in historic buildings during mothballing. Photo: NPS files. The absolute minimum air exchange for most mothballed buildings consists of one to four air exchanges every hour; one or two air exchanges per hour in winter and twice that amount in summer. Even this minimal exchange may foster mold and mildew in damp climates, and so monitoring the property during the stabilization period and after the building has been secured will provide useful information on the effectiveness of the ventilation solution. There is no exact science for how much ventilation should be provided for each building. There are, however, some general rules of thumb. Buildings, such as adobe structures, located in hot and arid climates may need no additional ventilation if they have been well weatherized and no moisture is penetrating the interior. Also frame buildings with natural cracks and fissures for air infiltration may have a natural air exchange rate of 3 or 4 per hour, and so in arid as well as temperate climates may need no additional ventilation once secured. The most difficult buildings to adequately ventilate without resorting to extensive louvering and/or mechanical exhaust fan systems are masonry buildings in humid climates. Even with basement and attic vent grills, a masonry building many not have more than one air exchange an hour. This is generally unacceptable for summer conditions. For these buildings, almost every window opening will need to be fitted out with some type of passive, louvered ventilation. Depending on the size, plan configuration, and ceiling heights of a building, it is often necessary to have louvered opening equivalent to 5%-10% of the square footage of each floor. For example, in a hot humid climate, a typical 20'x30' (6.1m x 9.1m) brick residence with 600 sq. ft.(55.5 sq.m) of floor space and a typical number of windows, may need 30-60 sq. ft.(2.75sq.m-5.5 sq. m) of louvered openings per floor. With each window measuring 3'x5'(.9m x 1.5 m) or 15 sq. ft. (1.3 sq.m), the equivalent of 2 to 4 windows per floor will need full window louvers. Small pre-formed louvers set into a plywood panel or small slit-type registers at the base of inset panels generally cannot provide enough ventilation in most moist climates to offset condensation, but this approach is certainly better than no louvers at all. Louvers should be located to give cross ventilation, interior doors should be fixed ajar at least 4" (10cm) to allow air to circulate, and hatches to the attic should be left open. Monitoring devices which can record internal temperature and humidity levels can be invaluable in determining if the internal climate is remaining stable. These units can be powered by portable battery packs or can be wired into electric service with data downloaded into laptop computers periodically. This can also give long-term information throughout the mothballing years. If it is determined that there are inadequate air exchanges to keep interior moisture levels under control, additional passive ventilation can be increased, or, if there is electric service, mechanical exhaust fans can be installed. One fan in a small to medium sized building can reduce the amount of louvering substantially. If electric fans are used, study the environmental conditions of each property and determine if the fans should be controlled by thermostats or automatic timers. Humidistats, designed for enclosed climate control systems, generally are difficult to adapt for open mothballing conditions. How the system will draw in or exhaust air is also important. It may be determined that it is best to bring dry air in from the attic or upper levels and force it out through lower basement windows. If the basement is damp, it may be best to zone it from the rest of the building and exhaust its air separately. Additionally, less humid day air is preferred over damper night air, and this can be controlled with a timer switch mounted to the fan. The type of ventilation should not undermine the security of the building. The most secure installations use custom-made grills well anchored to the window frame, often set in plywood security panels. Some vents are formed using heavy millwork louvers set into existing window openings. For buildings where security is not a primary issue, where the interior is modest, and where there has been no heat for a long time, it may be possible to use lightweight galvanized metal grills in the window openings. A cost effective grill can be made from the expanded metal mesh lath used by plasterers and installed so that the mesh fins shed rainwater to the exterior. At the outset, it is important to determine which utilities and services, such as electrical or telephone lines, are kept and which are cut off. As long as these services will not constitute a fire hazard, it is advisable to retain those which will help protect the property. Since the electrical needs will be limited in a vacant building, it is best to install a new temporary electric line and panel (100 amp) so that all the wiring is new and exposed. This will be much safer for the building, and allows easy access for reading the meter. Most heating systems are shut down in long term mothballing. For furnaces fueled by oil, there are two choices for dealing with the tank. Either it must be filled to the top with oil to eliminate condensation or it should be drained. If it remains empty for more than a year, it will likely rust and not be reusable. Most tanks are drained if a newer type of system is envisioned when the building is put back into service. Gas systems with open flames should be turned off unless there is regular maintenance and frequent surveillance of the property. Gas lines are shut off by the utility company. If a hot water radiator system is retained for low levels of heat, it generally must be modified to be a self-contained system and the water supply is capped at the meter. This recirculating system protects the property from extensive damage from burst pipes. Water is replaced with a water/glycol mix and the reserve tank must also be filled with this mixture. This keeps the modified system from freezing, if there is a power failure. If water service is cut off, pipes should be drained. Sewerage systems will require special care as sewer gas is explosive. Either the traps must be filled with glycol or the sewer line should be capped off at the building line. While every effort may have been made to stabilize the property and to slow the deterioration of materials, natural disasters, storms, undetected leaks, and unwanted intrusion can still occur. A regular schedule for surveillance, maintenance, and monitoring should be established. The fire and police departments should be notified that the property will be vacant. A walk-through visit to familiarize these officials with the building's location, construction materials, and overall plan may be invaluable if they are called on in the future. The optimum schedule for surveillance visits to the property will depend on the location of the property and the number of people who can assist with these activities. The more frequent the visits to check the property, the sooner that water leaks or break-ins will be noticed. Also, the more frequently the building is entered, the better the air exchange. By keeping the site clear and the building in good repair, the community will know that the building has not been abandoned. The involvement of neighbors and community groups in caring for the property can ensure its protection from a variety of catastrophic circumstances. The owner may utilize volunteers and service companies to undertake the work outlined in the maintenance chart. Service companies on a maintenance contract can provide yard, maintenance, and inspection services, and their reports or itemized bills reflecting work undertaken should be added to update the building file. In reviewing mothballing plans, the following checklist may help to ensure that work items are not inadvertently omitted. Do the gutters retain their proper pitch and are they clean? Are windows and doors and their frames in good condition? Are masonry walls in good condition to seal out moisture? Is wood siding in good condition? Is site properly graded for water run-off? Is vegetation cleared from around the building foundation to avoid trapping moisture? Have nests/pests been removed from the building's interior and eaves? Are adequate screens in place to guard against pests? Has the building been inspected and treated for termites, carpenter ants, rodents, etc.? If toxic droppings from bats and pigeons are present, has a special company been brought in for its disposal? Have the following been removed from the interior: trash, hazardous materials such as inflammable liquids, poisons, and paints and canned goods that could freeze and burst? Have furnishings been removed to a safe location? If furnishings are remaining in the building, are they properly protected from dust, pests, ultraviolet light, and other potentially harmful problems? Have significant architectural elements that have become detached from the building been labeled and stored in a safe place? Is there a building file? Have fire and police departments been notified that the building will be mothballed? Are smoke and fire detectors in working order? Are the exterior doors and windows securely fastened? Are plans in place to monitor the building on a regular basis? Are the keys to the building in a secure but accessible location? Are the grounds being kept from becoming overgrown? Have utility companies disconnected/shut off or fully inspected water, gas, and electric lines? If the building will not remain heated, have water pipes been drained and glycol added? If the electricity is to be left on, is the wiring in safe condition? Have steps been taken to ensure proper ventilation of the building? Have interior doors been left open for ventilation purposes? Has the secured building been checked within the last 3 months for interior dampness or excessive humidity? Providing temporary protection and stabilization for vacant historic buildings can arrest deterioration and buy the owner valuable time to raise money for preservation or to find a compatible use for the property. A well planned mothballing project involves documenting the history and condition of the building, stabilizing the structure to slow down its deterioration, and finally, mothballing the structure to secure it. The three highest priorities for a mothballed building are 1) to protect the building from sudden loss, 2) to weatherize and maintain the property to stop moisture penetration, and 3) to control the humidity levels inside once the building has been secured. While issues regarding mothballing may seem simple, the variables and intricacies of possible solutions make the decision-making process very important. Each building must be individually evaluated prior to mothballing. In addition, a variety of professional services as well as volunteer assistance is needed for careful planning and repair, sensitively designed protection measures, follow-up security surveillance, and cyclical maintenance. In planning for the future of the building, complete and systematic records must be kept and generous funds allocated for mothballing. This will ensure that the historic property will be in stable condition for its eventual preservation, rehabilitation, or restoration. The author, Sharon C. Park, Senior Historical Architect, Heritage Preservation Services Division, National Park Service, would like to acknowledge the assistance of the following individuals in the preparation and review of this publication. H. Ward Jandl served as the technical editor and assisted with producing this Preservation Brief. In addition the following persons have provided invaluable information and illustrations: Ernest A. Conrad, PE; Doug Hicks, NPS Williamsport Preservation Training Center; Thomas C. Taylor, Colonial Williamsburg; Karen Gordon, Seattle Urban Conservation Office; Kevin B. Stoops, Seattle Department of Parks and Recreation; Michael Mills, AIA; Christina Henry, architect, Mary Beth Hirsch, Ohio Historical Society. Thanks also to Heritage Preservation Services Division staff members Michael J. Auer, Anne E. Grimmer, Kay D. Weeks, Tim Buehner, and Jean Travers, and to the numerous staff members of the NPS Regional offices who submitted comments. All photographs and drawings are by the author unless otherwise noted. Cotton, J. Randall. "Mothballing Buildings." The Old-House Journal. July/August, 1993. Fisher, Charles E. and Thomas A. Vitanza. "Temporary Window Vents in Unoccupied Historic Buildings." Preservation Tech Note (Windows, No. 10). Washington, DC: National Park Service, 1985. Frazier Associates. "Mothballing Historic Buildings." Preserving Prince William, 2. County of Prince William, VA, 1990. Michell, Eleanor. Emergency Repairs for Historic Buildings. London: Butterworth Architecture, 1988. "Mothballing Vacant Buildings," An Anti-Arson Kit for Preservation and Neighborhood Action. Washington, DC: Federal Emergency Management Agency, 1982. Solon, Thomas E. "Security Panels for the Foster-Armstrong House." Association for Preservation Technology Bulletin. Vol XVI no. 3 and 4, 1984. (note the design of the panels, but be aware that additional louvering may be needed on other projects).